We all hate the marketing users who corrupt our pristine social media worlds, right? Yeah, well you rely on these scumbags (among whom I count myself). Without the marketers, pitching relentlessly through social media, it would be awfully tough for these environments to survive. And, let’s face it: would you actually pay for Twitter? To get my full perspective on this, check out the guest post I just wrote for SocialTimes. This entry was posted in Articles, Media, Personal, social media and tagged Business, marketing, social media, Twitter on June 7, 2010 by Tom. Facebook Worth $25 Billion? Really? Private company valuations on SecondMarket (and other similar “exchanges”) make for great blog fodder, but I’m not sure I buy into the hype. The latest result for Facebook is a $25 billion valuation … for a company that celebrated being cash flow positive a year ago and has yet to turn a profit. Queue the sock puppets and launch a black rocket. It’s 1999 all over again. Let’s compare it to the actual values of public companies like AOL ($2.3 billion) and Yahoo! ($21 billion), as reported by TechCrunch today. Facebook at $25 billion without any real liquidity? I’m having trouble stomaching that one. Of course, I’m something of a skeptic, so take my opinions with a grain of salt. This entry was posted in Finance, social media and tagged AOL, Business, Digital Sky Technologies, DST, Facebook, Finance, initial public offering, IPO, Microsoft, MSFT, public company, publicly traded, SecondMarket, social media, sock puppets, TheGlobe, TheGlobe.com, valuation, Yahoo, YHOO on June 4, 2010 by Tom. Twitter just announced that it’s no longer letting its users push their own sponsored tweets. It’s about time. I’m not opposed to sponsored tweets (quite the contrary, actually), but I see Twitter’s decision as a business necessity, and I’m glad the company is in the right frame of mind. For a long time, Twitter was a great place to generate revenue … as long as you weren’t Twitter. I wrote about this several times for DailyFinance and BloggingStocks. Plenty of companies, especially those in the media sector, were including Twitter in their advertising deals, which opened up a new revenue stream for them. This entry was posted in Finance, Media, social media and tagged Advertising, Business, New York Times, NYT, revenue, social media, Twitter on May 27, 2010 by Tom. 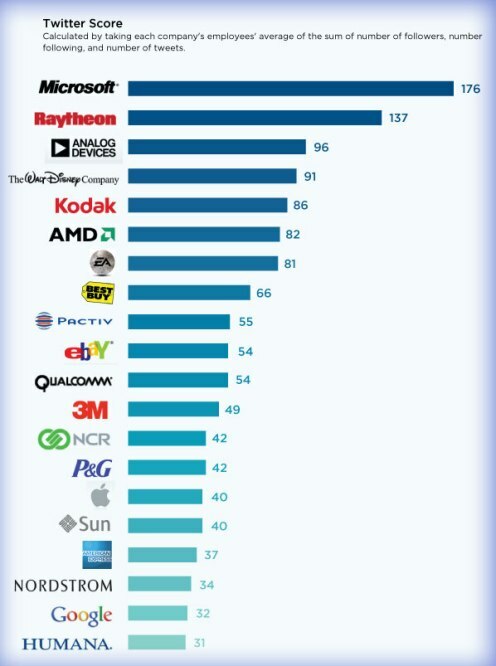 Just how the hell did Raytheon land in the #2 spot? And, it’s #8 overall! Microsoft may seem surprising, but it really makes sense, given that it’s packed with professionals and has employees who are more likely to be on the leading edge. Over at Mashable, there are a few more charts about social media adoption that will blow your mind. This entry was posted in social media, technology and tagged Business, charts, Facebook, LinkedIn, Mashable, Microsoft, MSFT, Raytheon, Twitter on May 19, 2010 by Tom. I took a look at this chart and almost lost my mind. I can understand the desire to maintain a certain amount of control internally, but the entire marketing world seems to be against outsourcing social media. That’s nuts! Social media, despite all the hype about “conversations with the marketplace” is really just another form of marketing. We need to come to grips with this. Anyone who remembers the dotcom days and has read the Cluetrain Manifesto realizes we’ve seen this movie before. It’s time to loosen up. This entry was posted in social media and tagged Business, Cluetrain Manifesto, MarketingSherpa, outsourcing, social media marketing on May 19, 2010 by Tom. Did you really think you’d read that headline six months ago? Well, a lot has changed since then! Claims of Twitter’s profitability arose the week before Christmas last year, when BusinessWeek used the two real-time search deals closed by the company (with Google and Microsoft) to do some basic math. It didn’t hold up, but the new year has brought new revenue. I strongly suspect that 2010 will be Twitter’s first in the black. What happened at the end of 2009? Well, in October, Twitter locked in $25 million in revenue through the Microsoft and Google data licensing deals. The company also revealed that its annual expenses were around $20 million. So, $25 million minus $20 million equals a $5 million profit, right? This entry was posted in Finance, Media, social media, technology and tagged Business, fire hose, Google, microblogging, Microsoft, profitability, real time search, social media, sxsw, Twitter on May 11, 2010 by Tom.